Valentine’s Day: it’s a holiday you either love or loathe. If you’re planning on celebrating it, make it personal for your loved one. If your beloved is a gardener, there are plenty of fun, creative, romantic, and affordable gift options for V-day. Since these gifts are more thoughtful than generic candy or a stuffed teddy bear, your sweetheart will appreciate them even more. Check out our favorite Valentine’s Day Gifts for Gardeners below. When you order, you get two live succulents in 2.5″ pots. Care instructions are included for these low maintenance plants. Delicious chocolate is my favorite part of the holiday and a frequent gift exchanged between lovers. Ditch the traditional heart-shaped box and give your favorite gardener these sweets instead. 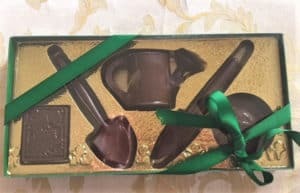 Handmade by Lady Sweet Cakes SC, this gorgeously packaged gift set includes five garden themed chocolates. The shapes are a watering can, a packet of seeds, garden shovel and spade, plus a wide-brimmed hat. These chocolate are made to order in your choice of milk, dark, or white chocolate. This is a sweet gift any gardener will appreciate. Gardening is rough on the hands, so let your lovely lady pamper herself with this gift. Made in the South of France, La Chatelaine is an organic luxury hand cream that nourishes, hydrates, and protects hands. It’s perfect for a cold winter’s day or after spending the day digging in the garden. This beautiful gift set comes in a tin with roses on the cover and includes three wonderful scents: pear, cinnamon orange, and amber cashmere. If your gardener loves fostering nature in their yard, especially for beneficial insects like butterflies, this is a sweet gift for them. Instead of giving them flowers on Valentine’s day, you’re giving them a whole summer of beautiful wildflowers with these seed bombs. 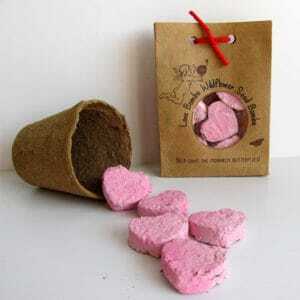 Made by Little Yellow Bird Seed, these seed bombs are pink hearts meant to be “thrown” into your garden where they will sprout wildflowers. This mix includes milkweed for monarch butterflies, as well as other beautiful flowers like zinnia, celosia, balsam, spider flower, tithonia torch and white sunflowers. Comes in cute packaging with a cupid on the bag. The most meaningful Valentine’s Day gifts for gardeners are personal ones. And this one is literally personal since it’s personalized! This adorable heart-shaped stone is fully customized with you and your partner’s name and the word “Love” with an infinity symbol. The stone is made of durable resin, perfect for indoor or outdoor display. If you’re looking for Valentine’s gift for the gardener guy in your life, check this out. 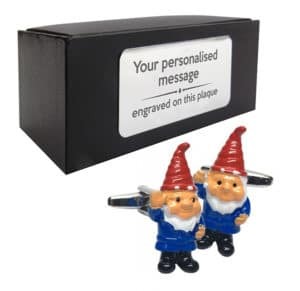 These fun garden gnome cufflinks are perfect to wear on dates while adding a little whimsy to the outfit. These garden cufflinks are handmade by CV Engraving and come in a box that can be personalized with a message to your partner. While rings are a wonderful gift to celebrate and show your love and commitment to your partner, fancy engagement and wedding rings don’t mix well with hard garden work. These beautiful silicone rings from Enso are a safe alternative. The hypoallergenic silicone material is comfortable and easy to wear while weeding, mowing the lawn, or potting plants. Available in a variety of colors and styles, you’re sure to find the perfect one for your beloved. If you can’t imagine Valentine’s Day without a bouquet of flowers, here’s an eco-friendly option that gardeners will love. 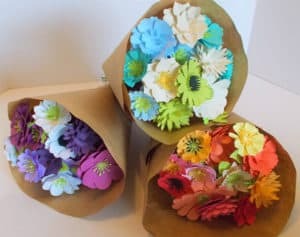 Paper Sprouts specializes in making gorgeous paper flowers out of paper embedded with wildflower seeds. They can be displayed indefinitely in their home and then the flowers can be “planted” to sprout a beautiful wildflower garden. This is a gift that keeps giving throughout the year. Each bouquet includes 12 flowers. Another cute alternative to traditional roses, an aloe plant is a wonderful gift for any gardener any day of the year. 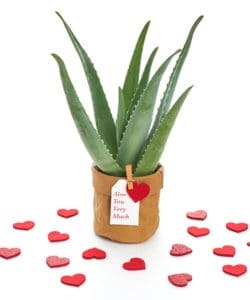 This specially themed planter for Valentine’s Day includes a 4″ aloe plant with the message: “Aloe you very much.” Cute and simple, this a great gift to send a long distance lover or friend to celebrate the holiday. Jewelry is a traditional Valentine’s Day gift, but this necklace is much sweeter than some generic sparkler. 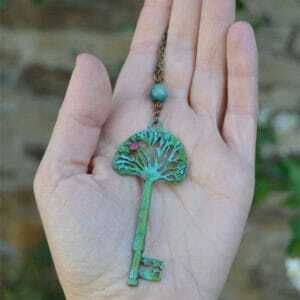 Handmade by Valkyrie’s Song, this pendant necklace features a handpainted tree key which is the key to the “Secret Garden.” Whether your gardener loves the classic book or just enjoys beautiful greenery, this is a lovely necklace to give them. Get more gardening gift ideas with our articles about unusual garden gifts, practical gifts for gardeners, and gifts for urban gardeners. Looking for more Valentine’s Day gift ideas? Check out these spicy hot Sriracha V-day gifts, romantic gifts for readers, and Valentine’s Day gifts for writers.